Gosh it's been a while since we last had a chit chat! I've wanted to come pop by and say hello for many weeks now, the crazy thing is I didn't know where to start, and so I kept putting it off. I always find it a tad overwhelming getting back into blogging after an absence. I feel almost like I've let you guys down for not being consistent with my posts. 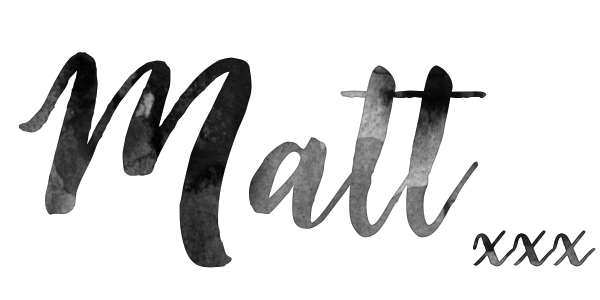 Then there's always the question of how do I get back into my Blogging? Do I fill you in on all the weeks that I haven't blogged, or just continue as if I never had a break? I decided on a half way point....move forward and over the next posts if I feel like sharing something from the previous weeks, then I will....I guess there are no rules. I've been working on projects, trying hard to finesse a few pattern ideas and work on new designs. It's my goal for this year! I have so many ideas floating around in my head, I do struggle to make them a reality though. Often its that I'm being a little too harsh on my judgement and not letting my projects have a moment to live before I decide that it doesn't work and frog the whole thing. I'm going to keep at it though, as I'm hoping the penny will drop and with some perseverance I'll make the ideas in my head become a reality. A reality that (hopefully) I'll be proud/happy enough to share with you guys. So what else have I been working on? 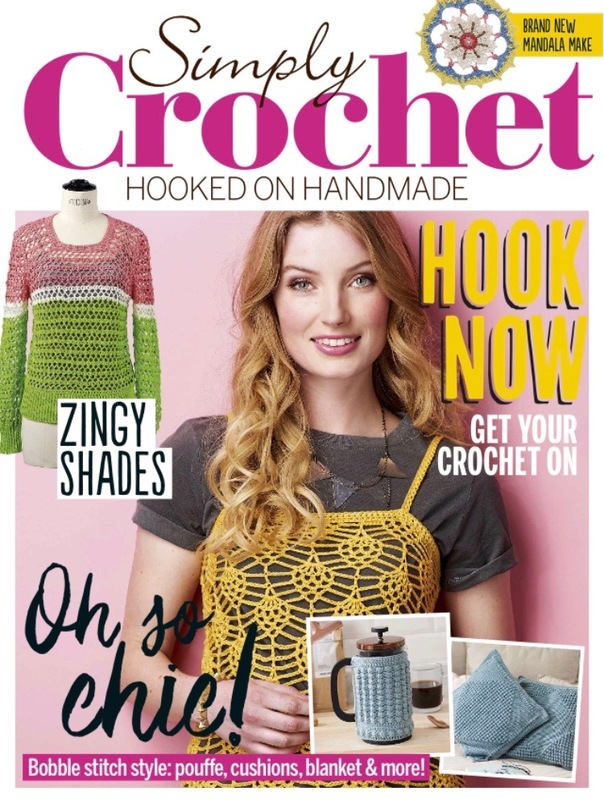 A little while ago I was asked to write for Simple Crochet magazine. A small article on whatever I desired. This week I received the May issue of the magazine in the mail and was delighted to see the article that I had written printed amongst the pages. I am so completely chuffed to say that Boys & Bunting are featured in this months magazine!! 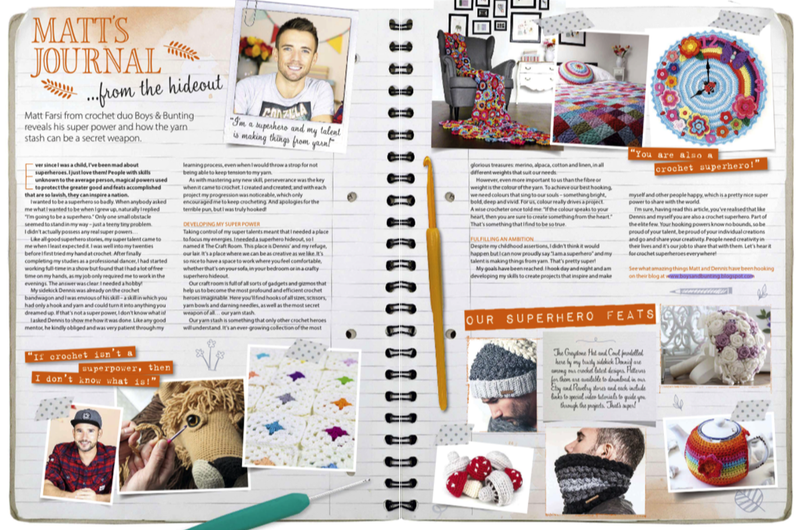 A couple of pages showing of our projects and an article of me jabbering on about us all being inspirational crochet superheroes. It was a fun column to write and has been pretty well received, which is always nice. I've received some lovely comments and lots of support from you guys! So....now I'm going to have a gander through the rest of the pages, sipping on my coffee, basking in the morning sun before work and letting the other glorious creations in this months edition of the magazine inspire the socks off me! I'll be back soon promise....we have lots to talk about and I'm feeling more blog inspired than ever!!! Have a glorious weekend!